With more than a little nostalgia for the days when flying was still an adventure that anyone could participate in and the sky was not restricted and controlled as it is today, the author presents to us one of the original participants in that adventure. 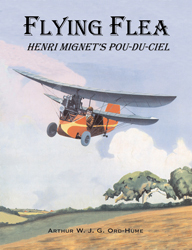 Frenchman Henri Mignet's creation, the Flying Flea provided the enthusiast of the era with a viable machine for a mere �25 (�65 with a decent engine). He took on the UK aviation bureaucracy and won, allowing ordinary folk to build and fly his soon-to-be-famous little machine. His story is the stuff of Boy's Own heroics and in the telling of it the author allows us to re-live his own youthful enthusiasms in the early years of flying.